723.5-pound alligator caught in Mississippi. Photo credit: Mississippi Department of Wildlife, Fisheries, and Parks. It’s only been three days since the start of Mississippi’s alligator hunting season, yet a pair of parties have already submitted two record-breaking ‘gators, state wildlife officials announced Monday. Dustin Brockman of Vicksburg, Miss., ventured with his brother and friend into the Mississippi River by motorboat early Saturday night and emerged with a 727-pound record breaker that was 13 feet, 4.5 inches long.The previous weight record was 697.5 pounds, according to Ricky Flynt, program coordinator with the Mississippi Department of Wildlife, Fisheries, and Parks. Brockman said that it took two hours after hooking the alligator using a crossbow before they could shoot it with a shotgun. It took four hours more to get it into the boat, but Brockman said it was too heavy to do with just the three of them, so they just waited in the middle of the river for the sun to rise. And just one hour prior to Brockman’s epic catch, a hunting party led by Beth Trammell of Madison, Miss., hooked a 13-foot, 5.5-inch alligator near Redwood. The Trammell party, which included six people, broke the previous weight record with their 723.5-pound catch and held the markbefore Brockman broke it 60 minutes later. The current length record, which has yet to be broken, is 13 feet, 6.5 inches. 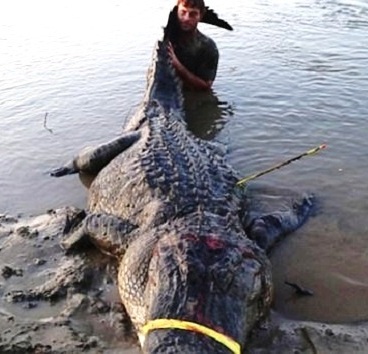 That alligator was captured on the Pascagoula River in 2008, according to the Mississippi Wildlife, Fisheries and Parks department. Brockman, who had never hunted alligator before this weekend, said the majority of the hunting occurs at night when it’s easier to spot the reptiles' eyes with a flashlight. Brockman said he plans to use the gator's skin for a gun strap and a picture frame and will eat the meat after providing some to his friends. Trammell said she plans to get the meat back from the processor as early as Friday. And the Trammell party will be back out on the water this weekend, hoping to catch another record breaker.